There's no question that Chip and Joanna Gaines are two of America's favorite people -- they do incredible work, and it's so fun to watch them do it on their hit HGTV show, "Fixer Upper." We had a chance to chat with Chip, who had just arrived home in Waco, Texas, after the announcement of his new collaboration with KILZ Primers. As someone who clearly gets the job done right from the very beginning -- this partnership seems quite natural for Chip, and he feels the same way. "For me, it really was a no-brainer. Jo and I early on concluded that we weren't going to work with partners if we didn't actually use their products. We weren't going to talk about companies or products we didn't know anything about." "KILZ is one of those brands whose reputation proceeded it -- I've always been a big fan of theirs, and I respect what they do in the industry." Earlier on in their careers, Chip and Joanna learned pretty fast that primer was the answer. "Early on, Jo and I would primer properties that we'd recently bought. Our houses appeared to be in complete disrepair, and just by doing something as simple as priming the drywall then — and true story, only then — we would bring our families over to see the properties we'd bought." When they hadn't done so? Chip says their families said "You're crazy! what are you doing?" "We just had to prime a bit and then they'd come back a few days later, and the house smells better, no mildew or stain marks on the drywall and all of a sudden ... my parents and Jo's parents became wildly optimistic and thought we were geniuses!" When it comes to paint, that's one of the things Chip recommends most for doing projects at home. 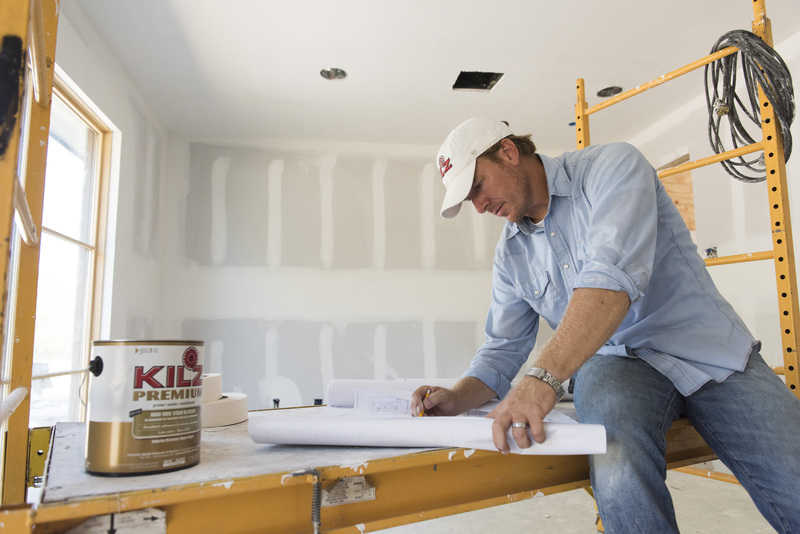 We asked him about the biggest mistake people tend to make when DIY-ing a project, and he said it's, basically, biting off more than you can chew. "I would encourage everybody to start in your comfort zone," Chip said, "Start on projects that meet your expertise. Using big heavy equipment is not for everyone. Using circular saws and miter saws are not for everybody, you know? People can get injured if you step out of your comfort level, but I love painting walls because there's not much of downside. if you mess up paint, you can just prime the walls and start over." Obviously, Jo and Chip do a whole lot more than prime and paint when they work on someone's home, and it's always breathtaking to see the final product. So how does Chip want someone to feel after he and Joanna have worked on their home? "I want them to feel relieved, I want them to feel overwhelmed. Jo and I have very high expectations -- we rate ourselves very critically, and we don't feel satisfied unless people are literally beside themselves." We couldn't help but ask this final question -- and turns out it's the second-most asked question for Chip and Joanna ("What happens to all that beautiful furniture?" is the first!) -- would they consider doing work outside of Texas? Chip's answer was just about perfect. And so very Chip. "We love this question! I'll give you the simple answer: Joanna and I have these four beautiful babies, and we have a real business in Waco, Texas. And it's so exciting -- so tempting! We'd love to figure our a model that would allow us to go to different markets and enjoy other people's hometowns, but God has called us to Waco, Texas. He's called us to this beautiful family of 6 -- four kiddos and Jo and I -- so it would be really difficult to take that show on the road." But that's also why they're doing the various projects right now that they are -- Joanna is working on a paint line, Chip partners with KILZ, their Magnolia Market is accessible online, they have a new book, and so much more. "It's our way of saying, 'Hey, we want to be a part of your lives, we want you to take us home with you, but not actually take us home with you... because we have four babies!'" Could you possibly love him any more?